Service Industry Night with $3 Drink specials all night and DJs spinning Goth/Alternative/Industrial. Stained-glass windows, high-beamed gothic architecture and hundreds of candles spread throughout The Church suggest a pious vibe, but the congregation is as mixed as they come. 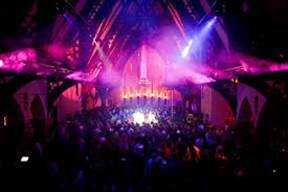 Completed in 1889 as a house of worship and then bought and converted into an iconic Denver Nightclub, The Church opened on Dec 31, 1996. Features include new state-of-the art lighting design and the top-rated Void Acoustics Incubus Sound system. The roomy, multi-level Lincoln Street mainstay draws globally based DJs, local residents, retro lovers, even the under-21 set: sections of the bar are open to those 18 and up. A rooftop patio affords one of the city's best views. This is Denver’s premium dance club experience.